Your Service Desk employees are stressed out, and your user satisfaction surveys are, shall we say, less than glowing. What's a Service Desk Manager to do to get some respect? 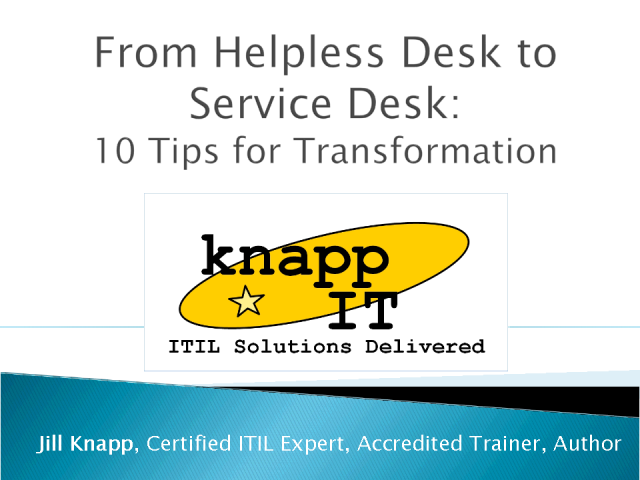 Attend this BrightTalk presentation with Senior Consultant, ITIL Expert and Author Jill Knapp of Knapp I.T., Inc. to learn some tips and tricks for transforming your Service Desk into the champions of IT. Jill Knapp, Senior Consultant, ITIL Expert & Author, Knapp I.T., Inc. Presented by: Jill Knapp, Senior Consultant, ITIL Expert & Author, Knapp I.T., Inc.